● Kyle Busch started third and finished 27th. 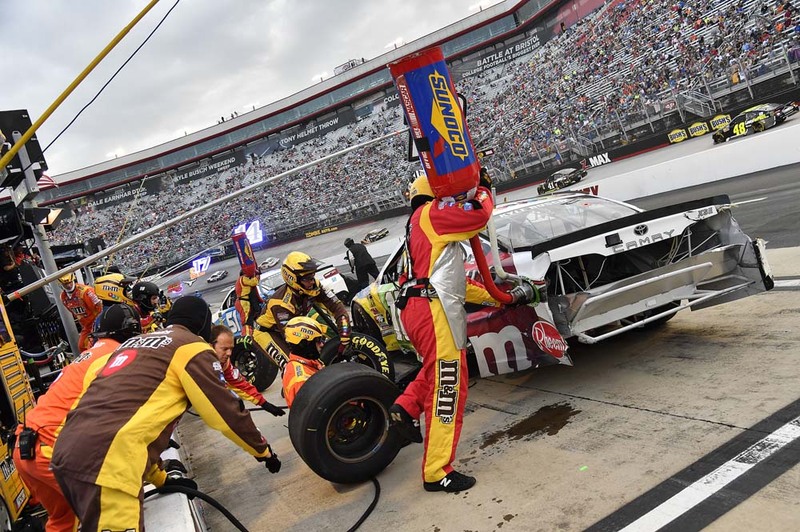 ● The M&M’S White Chocolate Toyota team had great expectations going into Saturday’s 500-lap race at Bristol, but high hopes were deflated on lap two when Busch found himself spinning down the frontstretch. 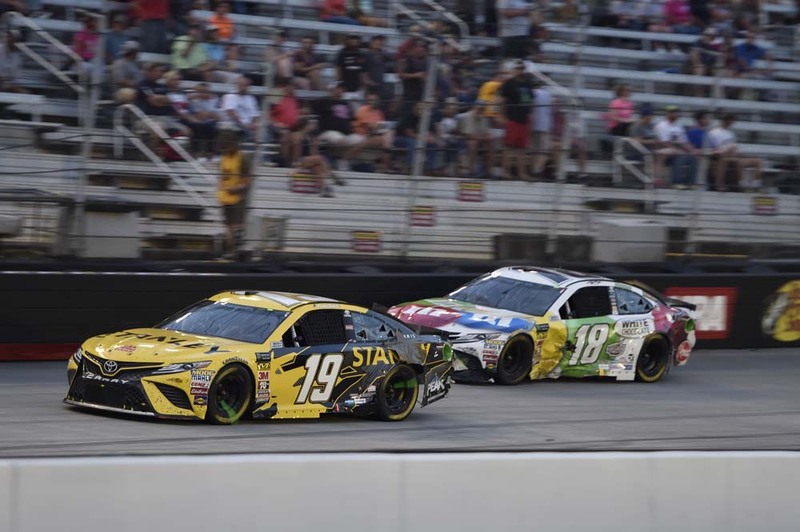 ● Busch was in the bottom groove in third place as the field entered turns three and four, but when he hit the bottom lane, the car got a little loose and contacted the No. 12 car of Ryan Blaney. The No. 18 spun into oncoming traffic and was hit by a handful of cars. The racecar’s rear deck lid was torn and there was damage to both the driver and passenger sides. ● The team made a series of repairs during the caution period. Busch wound up losing two laps during the process and was in 33rd place when green-flag racing resumed on lap 13. ● A caution on lap 62 gave the team another opportunity to work on the No. 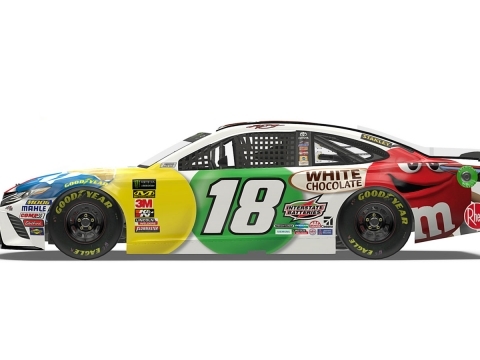 18 M&M’S White Chocolate Toyota Camry. Busch made a second trip to pit road for tires as the field was coming around to take the green flag. This resulted in Busch restarting the race from the tail end of the field and placed him in jeopardy of losing another lap. ● Busch was able to pull away and finish the stage in 27th place, two laps down. ● The team made a series of repairs during the caution, adjusted wedge, changed tires and added fuel. ● Busch started 27th and finished 20th. ● The 2015 NASCAR Cup Series champion quietly logged laps to start Stage 2.Caution waved on lap 197, giving Busch the first opportunity to take the wave-around and be in the position of only being one lap down. ● Busch was in 24th place and reported that the rubber continued to build up on the track, making it slick and inconsistent. 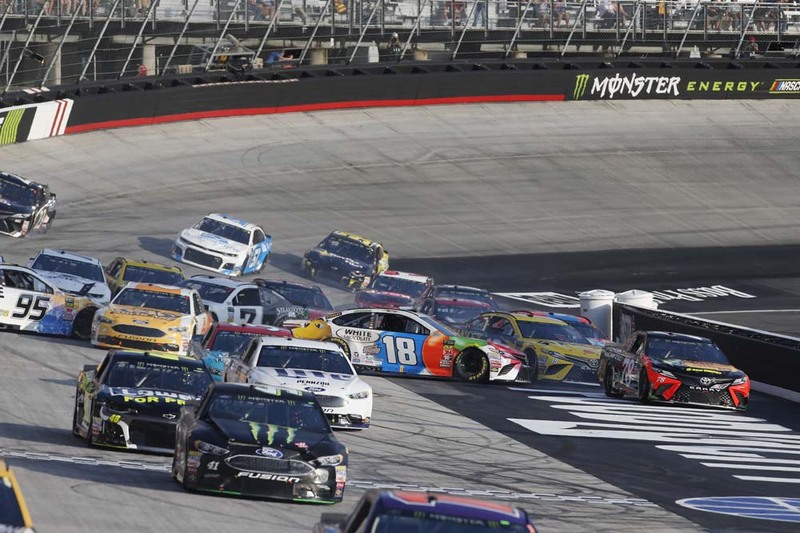 ● Upon the restart, Busch made a dash to try to position himself in front of the other cars also in the lap-down category. ● As the stage came to a close, fellow driver Kevin Harvick closed in on Busch to battle for the lead position among the one-lap-down racecars. ● Busch held onto the position in 20th place and earned the “free pass” which placed the No. 18 Toyota back on the lead lap. ● Busch started 19th and finished 20th. ● Busch patiently logged laps as he made his way back to the frontrunners. He was in 15th place on lap 284 and reported that the car’s handling was worse than the previous run. ● While the handling continued to be a problem, Busch continued making progress and was back inside the top-10 by lap 340. He was in ninth place when caution waved on lap 351. ● Crew chief Adam Stevens called for a number of adjustments to be reversed in an effort to get the car handling as it had during Stage 2. Damage on the quarter panels made it difficult for the team to fuel the car, costing Busch extra time on pit road. 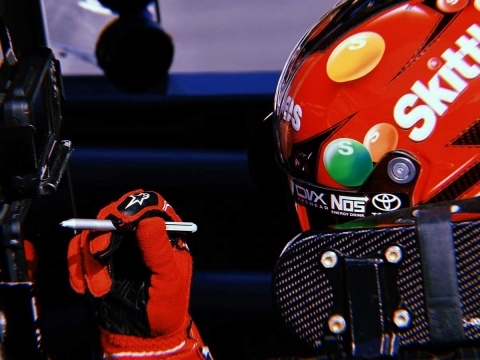 ● The Las Vegas native restarted the race in 15th place on lap 359, was back to the top-10 on lap 360 and made an aggressive drive to fifth place by lap 397 and third place by lap 415. ● An incident on lap 433 brought out the caution and handed Busch the runner-up position. Due to the issue with getting fuel in the car, Busch had another extended stop on pit road for four tires, adjustments and fuel. He restarted the race in 11th place and once again set to work making up track position. ● Busch was back to sixth place when caution waved once again on lap 471. Knowing fresh tires would be key during the closing laps, the team elected to have Busch stop for four tires. Some drivers stayed on the track while a couple more elected to do only two tires. This placed Busch in eighth place for the restart on lap 477. ● Just two laps later, contact with another car in tight racing resulted in a flat tire that caused the No. 18 to spin and make contact with the wall. 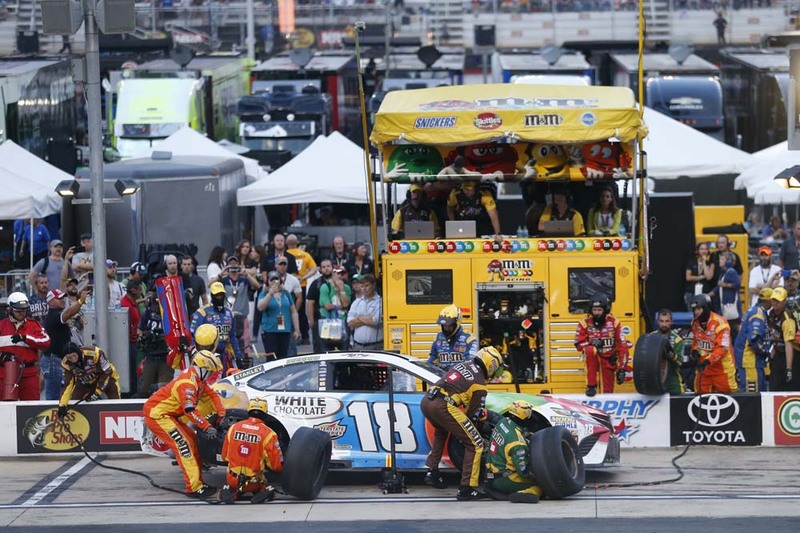 Busch was able to continue in the race but lost three laps while the team made more repairs. He finished the night in 20th place. Next Up: The next event on the Monster Energy NASCAR Cup Series schedule is Bojangles’ Southern 500 on Sunday, Sept. 2 at Darlington (S.C.) Raceway. The race starts at 6 p.m. EDT with live coverage provided by NBCSN.